In 2 Timothy 1:5-12, Paul is encouraging Timothy who is a young Pastor. Paul starts off by letting Timothy know the faith he has started with his grandmother, then his mother. It was not an accident that he was being used by God, the faith in his family was growing. From one generation to the next God was increasing their territory, because of their faith. Paul was letting Timothy know, God had invested in them, and was starting to see great returns on His investment. This is the reason why Timothy’s ministry was being attacked, because he was becoming profitable for God. What was now happening in his ministry was causing him to loose sight of his purpose. Paul had to remind him, he did not have a spirit of cowardice, but of power, love, and self discipline. This is the investment God made. God will never allow His investment to be ill equipped, because He sets up His investment for success. This is what Paul was sharing with Timothy, that he was not a failure. He was saved, had a Holy calling, and it was according to God’s purpose and grace. Once he understood all this he could rekindle the gift of God within him. 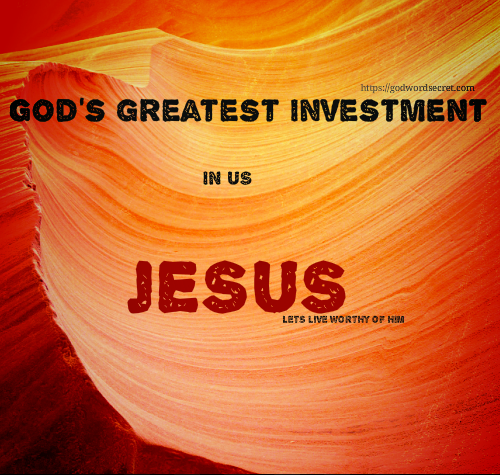 Paul was reminding him, you are God’s investment. In 2019 you are going to rekindle the gift of God within you! God does not want you to focus on your obstacles, because there will always be something trying to get in the way. You have to see the opportunities before you, and remind your self of what God has invested in you. You have been given a purpose and the grace to do it. Now you can have profitable returns for God. Be blessed!